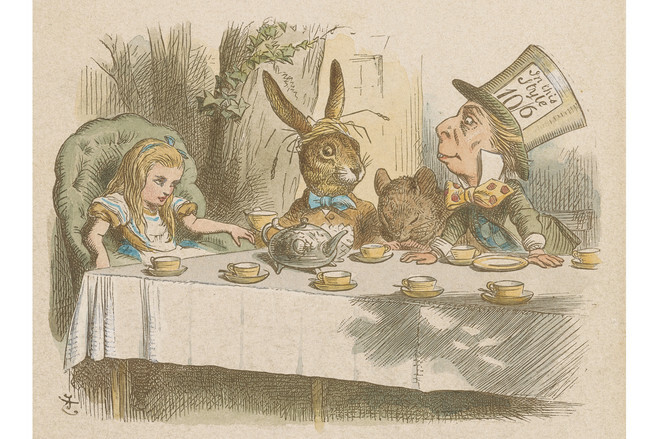 The Mad Tea Party, 1885, Hand-colored proof. Morgan Library & Museum. From imprisoning ‘bad’ historians to Alice in a world of wonderlands, here are this week’s top picks in imperial and global history. Jan Grabowski, a historian at the University of Ottawa, expects his upcoming book to be controversial in his native Poland. But if a proposed new law is approved by Poland’s parliament this fall, as expected, Grabowski’s book, which examines the role of Poland’s police force in robbing and murdering Jews under the Nazis, may also get him sentenced to prison if he visits the country. “Young people will now think twice before even studying Jewish-Polish relations” if the legislation is passed, warned Grabowski, who noted that teaching and research jobs are already scarce in Poland, where government-funded universities are the major employer. A few years ago, I was chatting with some US politicians in Washington when the conversation turned to Afghanistan — and the Allied strategy there. “Let’s hope we don’t see a repeat of Gandamak,” I joked grimly. “Gandamak?” one of the group asked, looking baffled. I explained that I was referring to the first ill-fated effort that the British had made to conquer Afghanistan, in the 19th century, which ended in retreat — and brutal slaughter at the village of Gandamak. The Imperial War Museum in London: A Lesson in State Propaganda? In January 2016, I attended Tate Britain’s Artist and Empire: Facing Britain’s Imperial Past, a disappointing exhibition that in spite of its title did not face Britain’s past in any meaningful way. On the contrary, as I argued in my review, it shied away from this bloody history in favour of quasi-glorification, non-committal wording and vague descriptions that resulted in an exhibition sorely lacking any critical analysis of the realities of colonialism and imperial rule. A few days after I visited this exhibition, the results of a survey concerning the UK public’s attitude towards the British Empire were announced. This survey found that 44 percent of the public were proud of their country’s colonial past and 43 percent believed that the British Empire was a good thing. Something about walking naked through the ruins of St. Bernard Parish at 2 in the morning helped Tech Sgt. Mickey Giovingo leave Iraq. Since returning from war, he had slept in his car in the driveway of his smashed, cream-colored ranch house, in his uniform—the only clothing he had. He remembers sitting out there at night, thinking, “There are more noises at night in the desert than here.” He was hypervigilant, startling at the smallest sounds. After Empire Must Come Nation? During the last two decades a revisionist wave has gripped the historiography about imperial breakups. A venerable topic at least since World War I, generations of historians strove to explain why multinational empires crumbled to give way to nation-states. The entire scholarly field of nationalism studies was in good part a branch of this gigantic question, which the Yugoslav Wars once more thrust on historians’ minds. When we read comparatively, we are actually reading across time as well as across space and language. And we now have a very unusual opportunity to do so. To honor the 150th anniversary of Lewis Carroll’s Alice’s Adventures in Wonderland, first published in 1865, a group of 250 translators, scholars, and literary historians banded together to produce Alice in a World of Wonderlands: The Translations of Lewis Carroll’s Masterpiece. This three-volume, 2,656-page compendium, heroically edited by Jon A. Lindseth and Alan Tannenbaum, has all the trappings of rigorous scholarship — Three heavy volumes! Lists and charts! An entire volume devoted to bibliography! — but it also contains many unexpected and quirky delights. Since this is a book about the work of Lewis Carroll (né Charles Dodgson), inventor of the Mad Hatter, the Queen of Hearts, and a host of other seriously absurd and absurdly serious characters, it is only right that the learned enterprise has a bit of playfulness around every corner.